It was during that conversation, just after his team earned second place in the cooking competition, he learned about Johnson and Wales University — a private career-oriented college in Providence, RI. Blas originally thought he would just “try his luck” when he decided to apply after returning home from the competition and researching the university. Several months later, he received a call from the school delivering the exciting news. He had been accepted and was receiving a $32,000 scholarship. “I was shocked,” Blas said. Wiggins said she is thrilled Blas took her advice and applied to the university. “It can be surprising how we can impact the lives of students just by engaging and talking to them,” Wiggins said, whose son graduated from the university and considers it to be the ivy league of culinary colleges. Blas’ passion for cooking began at the age of 6 when he started helping his mother — who is a Nutrition Services team member at Deady Middle School — prepare dinner and fill tamale orders during the holidays. “From there, I just found enjoyment working in the kitchen,” Blas said. 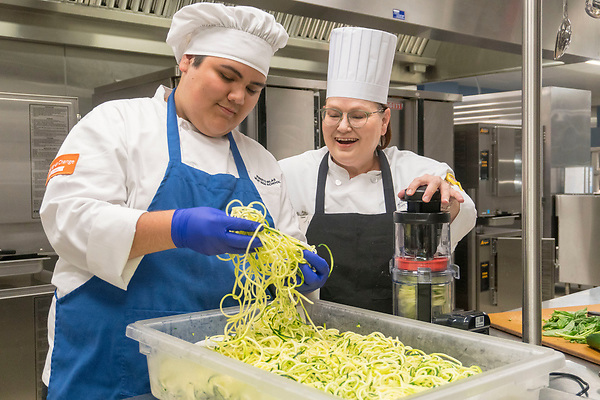 Milby culinary instructor Courtney Tucker noticed Blas’ leadership and drive early on. This August, Blas will be heading east to Rhode Island to start his new journey. “I am nervous and scared, but I feel the Culinary Arts Program here at Milby prepared me to support myself with the leadership, management and technical skills I have learned,” Blas said. With a bright future ahead of him, Blas aspires to be a professional chef and eventually open his own restaurant. Tucker has no doubt that he will accomplish all his dreams. “He is just that kid that you know is going to be successful,” she said.